Blockstream, a company set up in 2014 by crypto-hacker Adam Back, aims to change that. They announced in 2017 the launch of Blockstream Satellite, a one-way broadcast of blockchain data over four commercial geosynchronous satellites. At the time of the system’s launch, about two-thirds of the landmass of the globe was covered by blockchain broadcasts from on high. 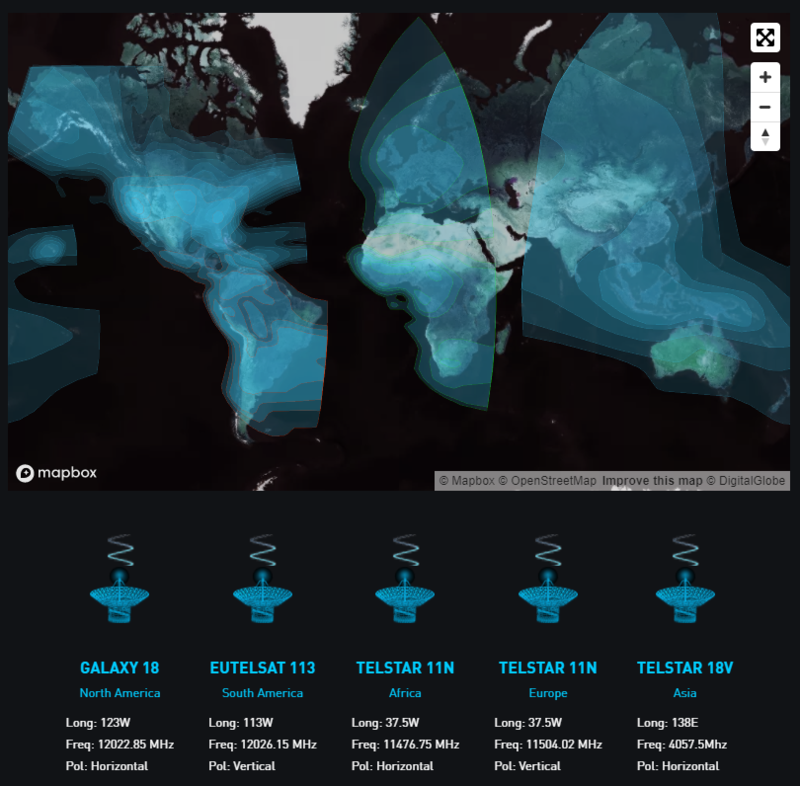 As of early 2019, a fifth satellite brought the Asia-Pacific region online, giving access to almost the entire globe. Also added in the 2019 release was an API that allows users to send files to the entire network. It’s important to note that Blockstream Satellite is a one-way system, at least for now. It only allows users to receive blockchain broadcasts; if a user wants to participate in a Bitcoin transaction, there still needs to be some sort of connection to the Internet. This would seem to bring us back to the original problem in terms of universality of Bitcoin, and in some ways it does, but Blockstream points out that there are low-impact ways to access the Bitcoin network. For example, a Bitcoin wallet on a smartphone could be connected to a satellite node, which could then, in turn, participate in a local mesh network to bring Bitcoin to a small village or isolated community. Perhaps this all means we’ll someday see solar-powered Bitcoin mining operations quietly hashing away at some remote location with nothing but a small satellite dish connecting them to the network. But to Blockstream and to cryptocurrency devotees, that’s not the point. To them, this is about strengthening the core feature of crypto: freedom from any central authority’s control of currency. Wow, they’ve engineered a way to make “money” fall from the sky. Why not icecream next? Almost that. Money aren’t falling from the sky, but money transfer logs. Put a solar panel together with a mining rig, and maybe that counts as money from the sky. Having actually done it (albeit for altcoins, not Bitcoin), I have to say that solar powered mining is a great idea, if you get in early enough which is true of mining in general. I wonder if some low bandwidth, long range wireless networks like LoRa might be a solution for sending transactions onto the network. Most Bitcoin transactions are less than a kilobyte. The latency is way too big for that. 20 minute per block on average is too much for commanding any army of bots. Better use HAM radio repeaters for that. Is bitcoin reaaaally that ubiquitous though? The breathless reporting on it these days seems mostly about its fundamental flaws, massive market manipulation, susceptibility to very old grifts and cons, and security vulns that make it not quite as trustworthy or foolproof as advertised as a ledger. Oh, and the real killer: virtually nobody uses it to buy goods and services. It’s not anywhere near as efficient than centralized, it’s not even as secure as centralized (despite over-hyped claims), and there’s no real organic mainstream adoption. A currency can’t survive on speculation alone, and most of those products and services that accept payment in crypto haven’t had a single taker in all the years that option has been offered. Even for products marketed towards the tech-savvy early adopter types. Outside a small but thriving black market, there’s virtually no economy being powered by crypto. Just a bunch of people buying it and sitting on it with hopes that somebody else will pay more later. I don’t think gimmicks are gonna save it. For it to become relevant and for it to complete its (admittedly dubious) libertarian mission, somebody needs to start buying groceries with it or something. I have read those arguments time and time again, and they are overblown. For and against. Fundamental flaws are the same as any central bank money: it’s value depends more or less on trust. There’s why money printed by Saddam Hussein and the Somali Central bank are still in circulation. Ask Google for Somali shilling or Swiss Dinars. If people trust it and use it, anything has value. Market manipulation is a problem, but only if you view bitcoin as a store of value. If you see it as a value transfer, this problem goes away. I bought my current OnePlus using it. The seller would not accept my card, but would accept BTC. I bought some, transferred to him, and he sent me the phone. I don’t live in the US, so I prefer paying in BTC when available, because the exchange ratio is way better than paying on my credit card. I can pay VPN, my co-location hosting provider, even buy things on Amazon using a remailer, paying on BTC. I pay around 15% less using BTC. Security vulnerabilities making it not trustworthy is something I am not aware of. There are vulnerabilities on some wallets, but that does not affect the blockchain in any way. As far as I know (and I am on the field for a while), no vulnerability on the ledger has been found. There’s the issue of a 51% attack, but the cost to execute it is on the millions of dollars, so it’s not really feasible. Acceptance is small, but increasing. Overstock.com, NewEgg, NameCheap, Shopify, Proton Mail, Private Internet Access, NordVPN, SurfShark, CyberGhost, and a lot more. Steam used to accept it, but the fees where so high they dropped that option. With fees going down again, and with advances of the protocol, maybe they will use BTC again, maybe not. On the other side, adoption after 10 years are still slow. It’s not easy to get into the market for the first time, and its mechanics are complex for the non-initiated. Buying and spending is not something mainstream users are able to do, as they need to overcome a lot of hurdles: KYC forms, choosing an exchange, wrestle with their banks for buying BTC, downloading and securing the wallet, or lefting the coins at the exchange and risk losing everything if the exchange is hacked or goes dark. Exchange security is woeful. Time and time again they are hacked and funds stolen. If you take into account that virtually anyone can start his own exchange with no oversight whatsoever, I am surprised there are so few hacks. But as the market matures, better managed exchanges will draw more clients from the poorly ones, and things will get better. Market manipulation is real, but smaller than it seems. The biggest manipulation in use today is inflated order book sizes. Exchanges (specially small ones) do this all the time, so it seems that their books are deep, and their have a lot of liquidity. Doing so attracts more people, bringing more transactions and more fees. Outright price manipulation is almost impossible today, as the market size is above 80 billion USD. Smaller than most public traded companies, but I doubt anyone with billions of dollars in cash somewhere would like to risk that amount trying to game the market. Don’t expect to buy groceries with BTC. The payment confirmation is too high for that. You won’t want to stay on the cashier for 45 minutes waiting for the payment to clear. Better use Ripple or another coin for that. There are issues, sure, Bitcoin is not as important as their proponents tell, and not as doomed as the detractors. But it’s here, and it’s working (for a certain rate of “working”). There a built-in incentive for fraud if you go to buy a sandwich and either you or the sandwich maker, or both are printing the money, as opposed to a trusted third party. Unless you are a crypto developer and you are pushing your own crypto, you cannot print your own money. You can mine it, but I assure you any mined crypto is thouroghly earned. All the respectable cryptos are designed to make counterfieting and inflation inducing inventory flooding impossible. No one is printing money, not even governments when it comes to crypto. That is one of it’s biggest strengths. I agree that debasing of a currency is a problem, but meaningful deflation occurs via higher interest rates. For example one can compare what a dozen eggs costs today as a percent of income versus what a dozen eggs cost 100 years ago as a percent of income. It is roughly the same percent. yea, it just goes to show just how wibbly-wobbly infationary/deflationary money can get. People/organizations sometimes tie a currency to something percieved as valuable like silver and gold but even they change in value over time. Look at the price of aluminum over the last 250 years. The US paid for the Louisiana Purchase to Napoleon with bars of aluminum which at the time was more precious than gold. Based on the last 250 years of history chicken eggs would probably make for a better base for price but obviously not the kind of thing one can stockpile and build up as a reserve. :-) In trade the value of everything is wibbly-wobbly. It’s just that some things are more so than others. Perhaps it is the differences in percieved value that helps drive commerce, encouraging trade. When the trade happens, both sides think they are winning for both value and trend. Distributed consensus addresses that, which is why it takes so long to confirm a transaction. I like to keep an eye on Bitcoin related stuff just because of that. I wish there was a leaner implementation of it. One could limit blockchain bloat and deal with lost coins if transactions older than x years of age (y number of blocks) would be declared null forcing a “move it or loose it” policy. If you move the value of an old wallet to a different wallet the transaction would be new and on a fresh block and the countdown clock would be reset for that amount of bitcoin. If the btc is not moved it is declared “lost” and would be unrecoverable except possibly through mining. Mining rewards could be declared to follow the usual halving schedule with a supplemental amount equal to a small percentage of the total lost coins. Older blocks including the genesis block would then be discardable because all transactions on them would be void. A huge benefit to all this is that one could fork in new and stronger encryption if needed down the road in case the quantum computing hounds get on btc’s tail. “freedom from any central authority’s control of currency.”, sure the folks with receiver dishes can see blochchain updates free of the ability of local nations to stop them, but this is dependent on 5 satellites and the organiation which operates them, doesn’t sound so decentralised any more. Also I’m sure anyone tuning in would find something like an uncensored copy of wikipedia in all major languages, repeating daily perhaps, to be a more useful thing to watch than blockchain transactions which they are not (without local ground interent connection) able to transact in anyway. I think is is more useful as a proof of concept. The same mechanism pulling data from satellites can be used to pull data from HAM radio, or mesh networks, or AM broadcast. It’s only the downstream now, but HAM radio could be used to provide the upstream if someone on the network of repeaters have an internet uplink. Yeeeeears ago, back when ISDN lines were an expensive luxury few home users could afford, I remember a similar service that was offered to ISPs, to deliver them a copy of the Usenet News feed by satellite. This freed up their backbone connection from needing to carry so much Usenet traffic, while still providing a feed to users. Any missed articles or uploads would go by the normal connection, but the vast majority would be handled by satellite instead. They probably still do that since one to many. mostly one-way still works well for NNTP. Bitcoin is for rebels, people who don’t like being told by “the man” what they may or may not do with their possessions. … hmmmm … sounds like Hackaday hackers IMHO. This satellite network is one more small step towards liberty for all. The trip along the Oregon trail seemed horribly long and treacherous but people got there one step at a time. Of course there will be dead along the way and many will “die” of crypto-disentary but many will not die and eventually enough will get there and someone will build a railroad and the new financial order will be established where no-one has their thumbs in everyone’s pies. Who is the person to tell me my purchase of a sandwich in cash is not a trusted economic transaction by default, and that the only was for the transaction to be trusted is for there to be a date/time stamp of it with an amount and account numbers? I speak for myself only but I will have nothing to do with someone who assumes lack of trust by default. It’s not that a lack of trust is assumed. It’s just that in some situations it is still prudent to do business with someone you actually don’t trust. It’s an upgrade to the range of interactions people can have, not a restriction or an insult. I’d gladly sell a hotdog to a total stranger about as easily as I would sell it to my best friend if I get paid first. Most of the talking about trusting in crypto is about 3rd parties. You may already trust the person you ar paying, but with regular money transactions, you also must trust your own bank and the recipient’s bank too along with other entities who may be involved in the network. In crypto, you don’t need to trust anyone else, just the person you are trying to do business with and even that is unnessessary if you would rather trust an agreed-upon middleman providing escrow. I respecfully disagree that there isn’t a trust requirement. In my view, it’s the cryptographic function that engenders a much larger portion of the total trust requirement. Furthermore, in the everyday world, trust is already there, built and reinforced passively. The fact that I can pass a stranger on the street and neither I nor the other person worry about muggings (presumably) reinforces the trust that already there between total strangers.